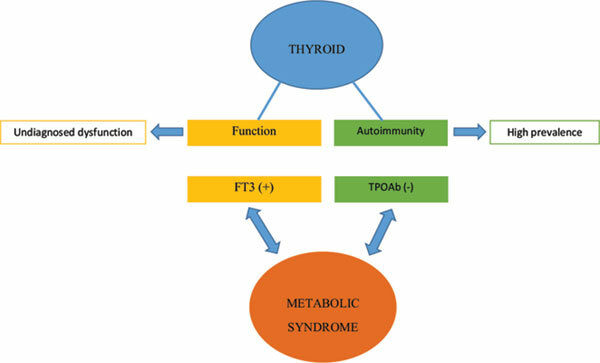 Background: The prevalence of thyroid dysfunction and autoimmunity in the Portuguese population has not yet been estimated. However, the national prevalence of the metabolic syndrome remains high. The association of thyroid pathology with cardiovascular risk has been addressed but is still unclear. Our study aimed to evaluate the prevalence of thyroid dysfunction and autoimmunity and to assess the associations of thyroid-stimulating hormone and thyroid hormones and antibodies with metabolic syndrome, its components, and other possible determinants in a national sample. Material and Methods: The present study included a subsample of 486 randomly selected participants from a nationwide cross-sectional study sample of 4095 adults. A structured questionnaire was administered on past medical history and socio-demographic and behavioural characteristics. Blood pressure and anthropometric measurements were collected, and the serum lipid profile, glucose, insulin, hs- CRP, TSH, FT4, FT3 and thyroid antibodies were measured. Results: In our sample, the prevalence of hypothyroidism, hyperthyroidism and undiagnosed dysfunction was 4.9%, 2.5% and 72.2%, respectively. Overall, the prevalence of positivity for the thyroid peroxidase and thyroglobulin antibodies was 11.9% and 15.0%, respectively. A positive association was found between free triiodothyronine and metabolic syndrome (OR: 2.019; 95% CI: 1.196, 3.410). Additionally, thyroid peroxidase antibodies had a negative association with metabolic syndrome (OR: 0.465; 95% CI: 0.236, 0.917) and its triglyceride component (OR: 0.321; 95% CI: 0.124, 0.836). Conclusion: The prevalence of undiagnosed thyroid dysfunction and autoimmunity was high. Thyroid peroxidase antibodies were negatively associated with metabolic syndrome and its triglyceride component, whereas the free triiodothyronine level was positively associated with metabolic syndrome. Keywords: Metabolic syndrome, cardiovascular disease, thyroid antibodies, hypothyroidism, hyperthyroidism, thyroiditis, prevalence, portugal. Keywords:Metabolic syndrome, cardiovascular disease, thyroid antibodies, hypothyroidism, hyperthyroidism, thyroiditis, prevalence, portugal. Abstract:Background: The prevalence of thyroid dysfunction and autoimmunity in the Portuguese population has not yet been estimated. However, the national prevalence of the metabolic syndrome remains high. The association of thyroid pathology with cardiovascular risk has been addressed but is still unclear. Our study aimed to evaluate the prevalence of thyroid dysfunction and autoimmunity and to assess the associations of thyroid-stimulating hormone and thyroid hormones and antibodies with metabolic syndrome, its components, and other possible determinants in a national sample.